Scientists have started to look more closely at the effects that sugar has on the brain, and a discussion is happening regarding whether or not sugar is addictive. Research studies and experts present differing views. Drugs of abuse cause the neurons in the brain to release dopamine, a feel-good chemical. This makes the brain and the body crave more of the drug to regain that pleasurable effect. Sugar activates this same reward pathway by creating a spike in blood glucose, the result being a temporary increase in energy and overall feeling of well-being. This pleasurable reaction to certain foods is a survival skill, designed to ensure that people satisfy their basic need to feed their bodies. Evidence supports that sugary foods create stronger cravings than other types of food, such as leafy greens. This suggests that eating sugar causes people to want more sugar. In a 2013 study, Joseph Schroeder, a professor of neuroscience at Connecticut College, compared a craving for Oreos to a craving for cocaine. "Our research supports the theory that high-fat/high-sugar foods stimulate the brain in the same way that drugs do," he said. Another 2013 study by the University of Bordeaux also found that "sugar and sweet reward cannot only substitute to addictive drugs, like cocaine, but can even be more rewarding and attractive." 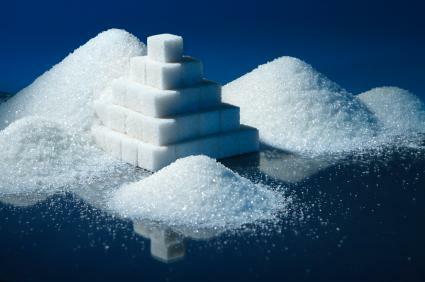 After a bout of sugar consumption, the pancreas creates insulin to distribute the sugar in the blood to the cells. When this happens, blood sugar drops, energy depletes and some people experience a shaky feeling, which makes them want to have more sugar to feel "normal" again. Some liken this cycle to the withdrawal and cravings cycle common to drugs of abuse. The question remains as to whether this crash is a withdrawal symptom, such as getting the shakes after giving up alcohol. Serious malaise after giving up sugar for a period of time can sometimes be attributed to diabetes. It is no secret that a high-sugar diet can lead to type II diabetes, even in children, which can wreak havoc on blood sugar levels and also cause withdrawal-like symptoms when the diet is altered. Sugar cravings can also be related to addictions to established drugs of abuse, such as marijuana, which affect the appetite. High amounts of sugar consumption can be extremely detrimental to your health, and future research may find additional links between sugar and addiction. The associate director for the Center for Childhood Obesity Research at Penn State's College of Health and Human Development, Cynthia Bartok, said, "Despite the anecdotal reports of people who claim to be addicted to sugar, and seemingly endless websites devoted to sugar addiction, modern science has not yet validated that idea." It is clear that more research is needed. If you think you are addicted to sugar and feel powerless to simply cut back, your best bet is to address your sugar consumption with the assistance of a healthcare provider or nutritionist. Support is available to you through the 12-step program Overeaters Anonymous, and you may have additional support groups in your area.